March 2017 – Click here to view the full Press Release. One of Irelands leading timber processors ECC Timber has appointed former Finance Minister and EU commissioner for Internal Markets Charlie McCreevy to its Board of Directors as a non-executive director. Mr McCreevys appointment marks the companies 25th year in business and is the first major appointment since the ownership of the company became 100% owned by the Fahy family in summer 2016 with the purchase of Aurivo coop’s shareholding in the business. Founded in 1992 by PJ Fahy, the company offers high quality sawn and planed timber products for the Construction, Fencing and Packaging timber markets in Ireland and the UK. ECC has grown to become one of the countrys leading processors of round log servicing the increasing Irish construction market; becoming Coilltes largest customer and the largest exporter of sawn timber products from Ireland from its base in Corr na mona, Co. Galway. On the announcement PJ Fahy said “We are extremely proud and feel very privileged to have a former Minister for Finance join our board; Mr McCreevy’s vast knowledge and experience from the worlds of politics, business and finance will be very beneficial as we continue to grow the business”. Commenting on his appointment Mr McCreevy said “I am pleased to be appointed to the board of ECC Timber, a family run company which has turned the challenges of the past number of years into a success story. I look forward to working with the company’s board to help drive further growth and development”. The company is currently in the second year of a 5 year capital investment program to further strengthen its service to the recovering Irish market and consolidate sales in the UK. Commenting on Brexit, Managing Director Daryl Fahy is confident of prospects for the timber industry in the UK, he said “The UK market is the largest timber market in the world per capita and must import over 70% to satisfy its timber requirments. This demand combined with our reputation for service and quality will safeguard our share of that market, FX volatility will remain a short term challenge however Coilte have helped mitigate that risk by introducing an indexed price for log supply, overall we look forward to increased demand from both Irish and UK markets”. 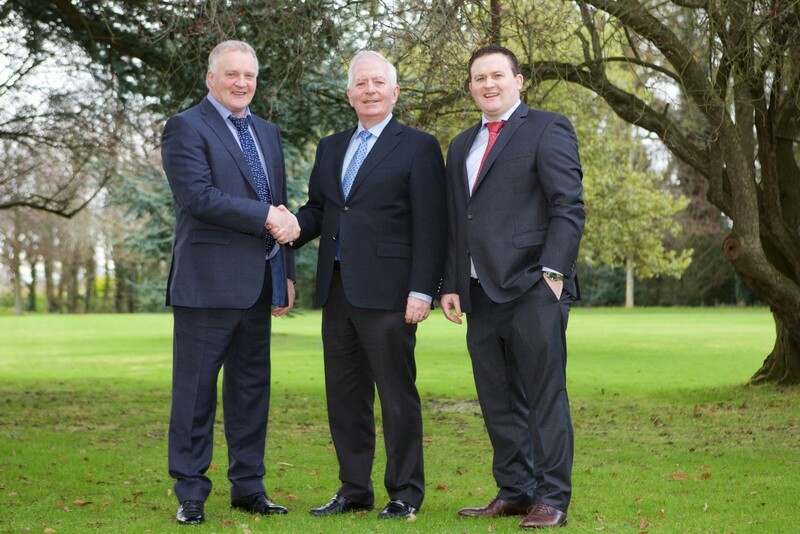 Pictured (L-R): PJ Fahy Chairman ECC, Charles J McCreevy ECC Director, Daryl Fahy Managing Director ECC.